This is a recipe from Simon Rimmer's Seasoned Vegetarian which I hadn't tried before. 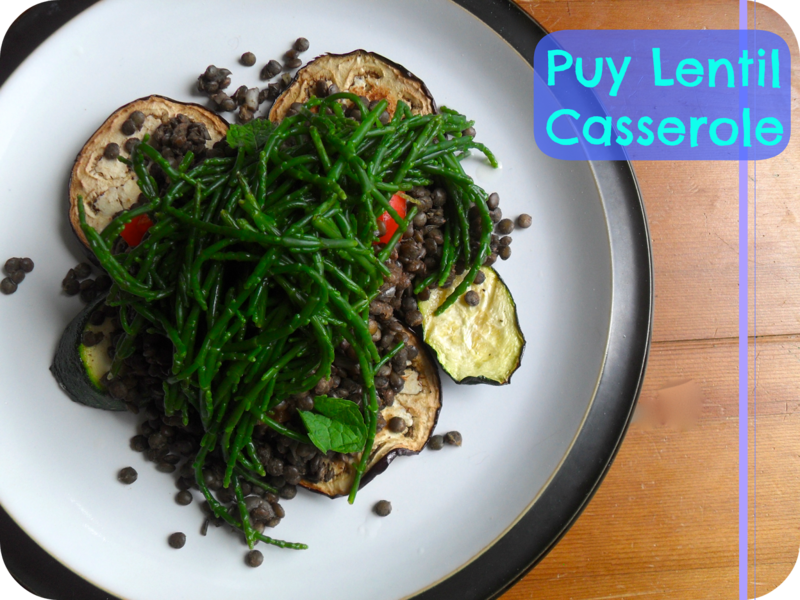 I was mostly swayed to try it because I came across samphire for sale for the first time from Ocado. Samphire is likened to seaweed often, it grows in marshy areas and is often served alongside fish. It's reasonably expensive, weighing in at £2.21 per 100g for the bunch that I bought. The original can be found here. Interestingly, this offers four servings whereas the book says six servings for the same amount. I think four is probably a little over-generous. This was not a particularly popular meal in this household. The samphire was an interesting new vegetable to try but so very salty that no-one managed to get through their portion. D did earn a sticker for trying it but I don't think he'd be keen to do so again. What was interesting is that he absolutely loved the lentils and ate a goodly portion. He also loved collecting the mint leaves - and eating them too! I haven't cooked puy lentils before and I will be giving it another go. A recent blog entry at Oh my Veggies made me keen to give them a try. Personally I felt that they needed a little more oomph. As the meal made three further servings that I've frozen for future occasions, I'll probably add a bit of sriracha when I defrost them. I'll just stick with the grilled vegetables rather than the samphire too. Substitute oil with frylight and interpreted a 'splash' of wine at 20ml. Stats: - 6 servings, 7pp each.